· Controls to all the typically fixed values for low-pass filters - both on oscillator outputs (changes tone from full square wave to pure sine, or anywhere in between) as well as on the detection circuit (which can fine-tune the accuracy of the octave-divider's tracking). · Option for two modes of operation: additive oscillators or phase-multiplier. The additive mode simply mixes in the octave down signals (via user-adjustable levels and wet/dry balance), whereas the phase-multiplier mode flips the phase of the key signal, following the state of the selected oscillator. · In additive mode, dynamics for the oscillators can be controlled either by a noise gate or an envelope follower, both keyed off the input signal. In phase-multiplier mode, the full dynamics of the key signal are retained. · A DC-offset switch corrects the input signal to improve tracking on rectified or offset signals. · A scope displays both the key signal and the output signal, so the user can see how the plug-in is operating, and help identify what controls need to be adjusted in order to track more accurately or produce the intended sound. Includes a "Scope Tuning" control to affect the zoom ratio. · "Listen" radio buttons allow the user to tap the audio at any stage to hear what's happening behind the scenes, and bypass certain sections if desired. · Many users of the Boss OC-2 pedal seek to add a hardware modification that disables the output filter and dynamics sections in order to produce a more synth-like tone. 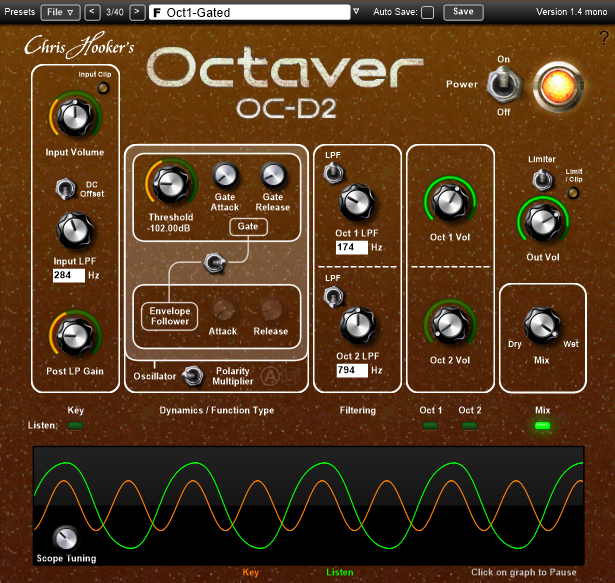 This plug-in has the capability to easily reproduce this mod, by adjusting only a few parameters. 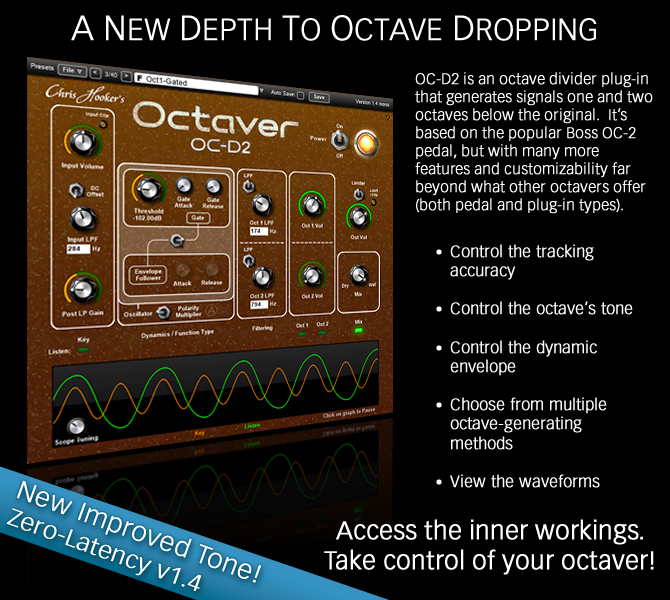 Included are some presets that run through the capabilities of the plug-in. This plug-in is free for both personal and commercial use, but please don't redistribute - just refer others to this page or directly to the download link above.